The German Handball Federation has announced the successor of Michael Biegler as head coach of the women's national team. 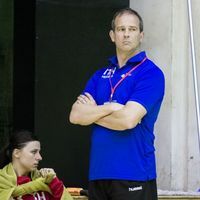 Henk Groener had been coaching the Dutch women's national team for several years up until late 2016, leading them to silver at the World Championship 2015 and to the semi-finals at the 2016 Olympic Games. The former Dutch international with 208 matches under his belt takes over the team from 1 January 2018. He has signed a contract until 31 August 2020 which includes the Olympic Games in Tokyo. Michael Biegler, who took over the German national team a year-and-a-half ago, will finish his stint, which had always been focussed on the upcoming Women's World Championship 2017 on home soil, at the end of December. He will become the head coach of German men's Bundesliga side SC DhfK Leipzig. “Henk Groener is an extraordinary coach for our women's national team. With him on board we ensure that our team will remain on top level also beyond the World Championship 2017,” said Andreas Michelmann, President of the German Handball Federation. “I'm looking forward to this new task and challenge and to continuing the development of the national team, building on the work of Michael Biegler and (sports director) Wolfgang Sommerfeld,” said Groener. The Dutch's first competitive matches will be a double-header against Spain in the EHF EURO 2018 Qualification in March. In their first two matches, Germany drew with Lithuania and beat Turkey.